Azure HDInsight is an Apache Hadoop distribution powered by the cloud. This means that it handles any amount of data, scaling from terabytes to petabytes on demand. Spin up any number of nodes at any time – we charge only for the compute and storage that you use. We are pleased to announce an easy way to distribute, discover and install solutions or applications that you have built for the Apache Hadoop ecosystem. These solutions can span a variety of scenarios from data ingestion, data wrangling, monitoring, visualization, optimizing performance, security, analyzing, visualization, reporting, and many more. 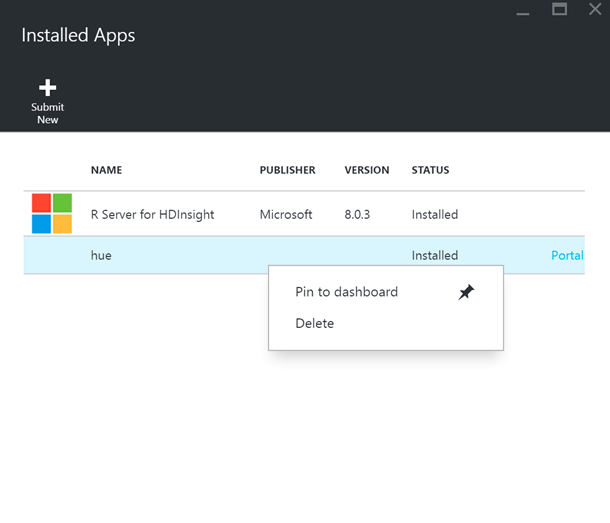 You can install these apps on an existing HDInsight cluster as well as while creating new clusters. The apps are installed on the Edge node and have access to the entire cluster. End users of these applications do not have to install or manage packages on each and every node and configure the application. Install solutions on existing HDInsight clusters. Solution providers can make their solutions available to users who already have an HDInsight cluster running. This allows users to use these solutions easily and increase their productivity. As a user, you can select the Applications blade to discover and install apps on your cluster. In the following screenshot, I had an existing cluster and I can discover the Datameer application. I can then click on the Datameer application for fast, easy installation on my existing cluster. Once I’ve installed Datameer on my cluster, I can now see it on my list of Installed Apps. You can also delete an installed application. In this screen shot, I had installed the Hue application, which I can easily delete by right-clicking on the application. Learn more about installing Hue here. This is a super easy way of discovering and installing solutions that help an end-user to be more productive with Hadoop. Using the same approach, you can create custom applications and share them with your team. "Azure HDInsight Application Platform is the most robust and stable framework we've seen to quickly configure and test Datameer deployments in the cloud. We had all the flexibility to iteratively test different deployment options for our solution as well as Marketing collateral within the same Portal. By far the easiest and fastest way to take your cloud-based solution to Market." If you would like to learn more about Datameer, please visit the Datameer listing in the Azure Marketplace. If you have solutions that you have built for the Apache Hadoop ecosystem and would like to make them available to HDInsight, then please do read the following documentation on how to make them available. We hope that you find this experience an easy-to-distribute solution to increase productivity of customers using Big Data. We invite independent software vendors (ISVs) to leverage this capability to make it easier for customers to discover and use your solution. Please reach out to hdipartners@microsoft.com if you would like to participate.